Saving this! Thank you for a clear, readable explanation I can pass on to authors, one with more depth than I’ve been providing. I’ll add that for anything rendered to a web page, multiple whitespace characters get collapsed into a single space for display. An exception is made for whitespace SGML entities (such as ), but regular double-spacing after a period doesn’t make the gap to the next sentence any longer. The spline panel, moderated by Chris Smith, is at 1 p.m. Thursday’s Lunch Lecture is on the Riemann hypothesis and will be presented by Pat Brown, Ph.D. Dr. Brown will answer questions following the talk. While that’s certainly not beautiful prose, it’s a real-world example (names changed) that a one-space rule made made needlessly harder to read. Great stuff, thanks (except for the last sentence, but then, I am English). A company I work for was still using double spaces in its publications till 2008 – the year I walked through the door. It should be obvious that double spacing after sentences, double lettering as in letters, and including silent letters in words like subtle, is a conspiracy to sell more paper. I actually was able to break the habit about five years ago, once I took my writing serious enough to consider publishing. I immediately had trouble with self-editing my work. I went back to the double space, and now just search/replace as a last step before submitting. I don’t really care if I show my age on social media or e-mails. I’ve always felt vaguely uneasy about the typewriter explanation: it just didn’t seem to make sense. Associating the habit instead with the fashions of an older style of typesetting feels a lot more plausible, since I’m familiar with the way older books seemed much more “spacey” in all aspects of their punctuation. And the typewriter explanation is actually counterintuitive in a way. If all characters have the same width, then a period takes up as much horizontal space as an M. But the period isn’t stretched out, meaning that it has some extra space built in already. I am an English into Spanish translator, born and raised in Mexico. I learned to typewrite in Spanish in the late 60’s. Even back then, when typing in Spanish, we were never taught to use two spaces after a period. It was quite surprising for me to discover the practice in Anglo-Saxon texts. The idea that it was to “aid readability” always sounded fake to me. After all, in Spanish only one space was used, and there were no “readability” problems. To this date, the two spaces still “bother my eyes,” and I feel a need to change them for one. All this to say that I believe it´s a cultural habit, and everybody knows habits die hard. 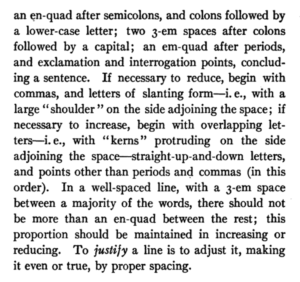 If typewriters were generally monospaced, then why was the Chicago Manual instructing people to add em-spaces and en-quads? Sounds like they didn’t have the choice if they wanted. Chicago was instructing typesetters, not typists. That is, professionally typeset text had extra spacing between sentences, and typists would hit the spacebar twice to replicate the look of professionally typeset text. Oh wow and now I know the difference between the two. Thanks for this. Sparks flew in the office this morning as a two-space debate took place. Excellent article. Thanks for including the bit about APA style. 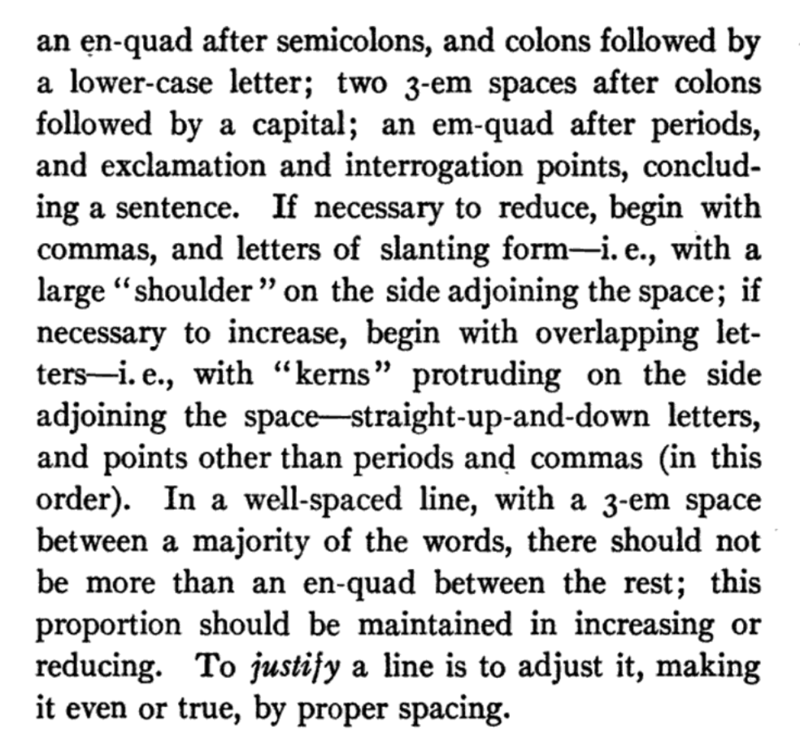 I’m so tired of explaining that typing two spaces after a sentence has less to do with how old one is than how strict one’s college professors were about APA style.